Offering many complimentary services including; daily breakfast, tea/coffee, high speed internet, a airport transfer. All hotel rooms are non smoking, with air conditioning, satellite/cable TV, in room wireless with high-speed Internet access, en suite bathroom, bathrobes and hair dryer. Facilities include a 24 hour reception, a business center. 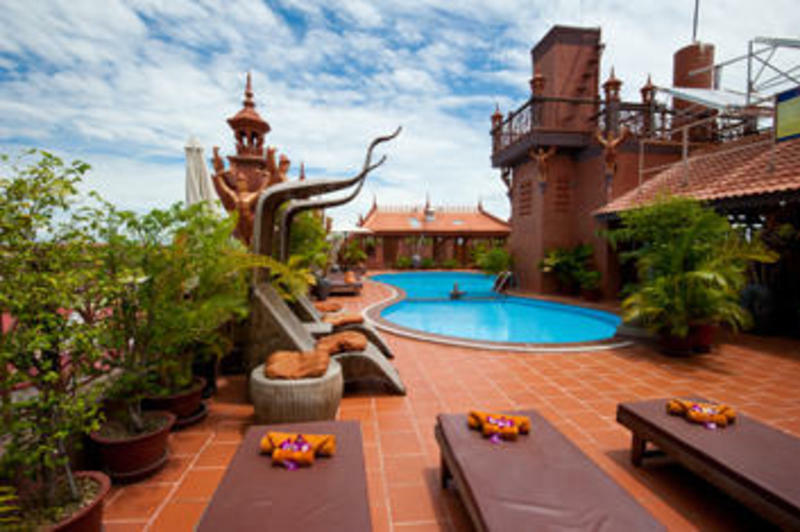 Unwind from a day of touring the Temples with a choice of relaxing treatments such as a long dip in a large top roof swimming pool with a good surrounded beauty sunset city view, a range of massage and beauty treatments. A full service poolside restaurant and bar is available for guests to retreat themselves with refreshing drinks. Comfort and convenience are the hallmarks of Okay 1 Villa Hotel. Okay 1 Villa is located in Siem Reap City and is only 7km from Siem Reap International airport and 10 km to Angkor Wat area..